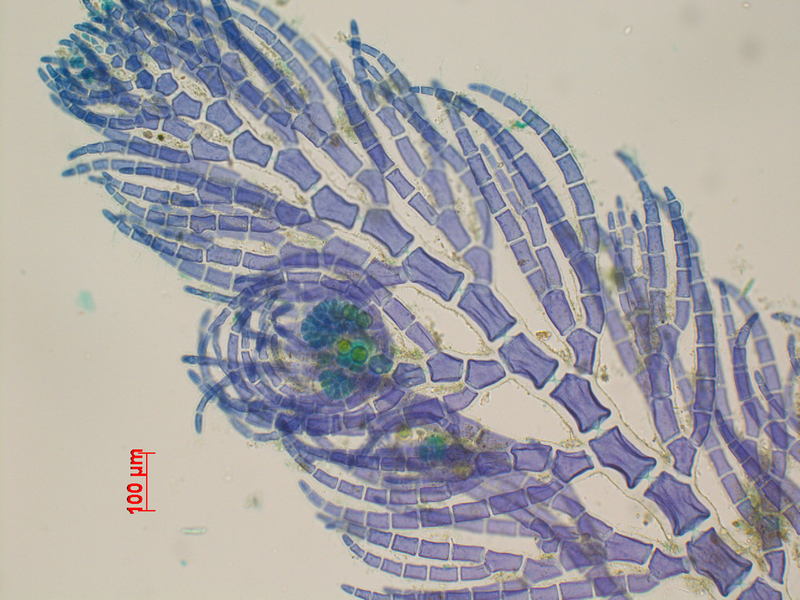 Plants, as found, under 1 cm in length, basally attached with a number of multicellular rhizoids. Erect axes with laterals alternating in one plane, re-branched often twice, somewhat shorter than the main axis. Axes without cortication, up to 150 µm in diameter, the cells in older part slightly shorter than broad, in younger parts slightly longer than broad. Apical cells 12.5-15 µm in diameter. Tetrasporangia single or with two together on cells of the upper regions of the laterals, sessile, measuring ca. 48 x 37 µm at maturity, division tetrahedral. Male plants not seen. 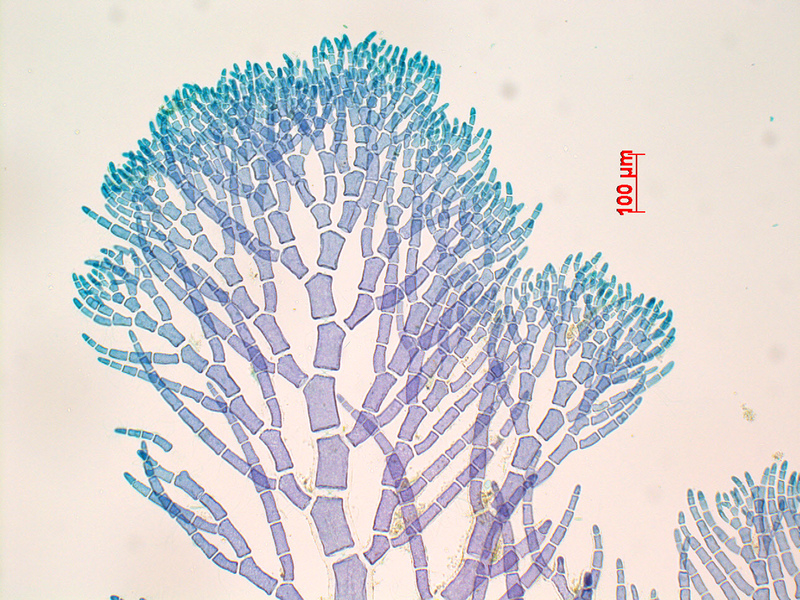 Female fertile filament developing in apical position on the side branches, the developing carposporophyte becoming surrounded by up to four re-branched ramuli from the sterile cell below it. Mature carposporophytes not seen. Recorded from Stilbaaai to the Port Shepstone area of KwaZulu-Natal (26-49). Apparently an uncommon species, mainly found in the sublittoral (down to at least 23 m), growing on other plants or animals. The species was described from KwaZulu-Natal (Norris, 1985). Type locality: Palm Beach, near Port Edward, KwaZulu-Natal, South Africa (Silva et al. 1996). Note: because this species has tetrasporangia rather than polysporangia, it should be transferred to Spongoclonium, as was done for P. caribaeum (Rosenvinge) R.E. Norris – see Wynne (2005). Pleonosporium callicladum, sterile thallus apex. (Morris Point, Stilbaai, 11m, on Zonaria sp; stained slide). 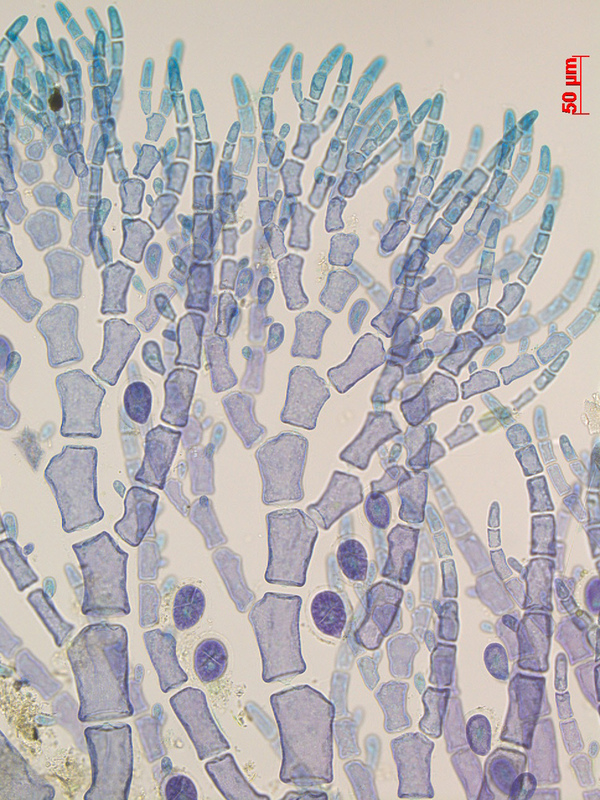 Pleonosporium callicladum, thallus apex with carposporophyte. (Morris Point, Stilbaai, 23m, on Heringia mirabilis; stained slide). Pleonosporium callicladum, tetrasporangia (see note); stained slide. Norris, R.E. 1985. Studies on Pleonosporium and Mesothamnion (Ceramiaceae, Rhodophyta) with a description of a new species from Natal. British Phycological Journal 20: 59-68, 28 figs.